I am an immense fan of Arthurian legend, and The Lady of Shalott is by far my favorite story from that. So when I saw that Song of the Sparrow was a re-telling of The Lady of Shalott, only with a happier ending (in the original poem she dies because Lancelot is a major d-bag, how depressing is that? ), I immediately snapped it up. It's deceptively short--while it may be 416 pages, Song of the Sparrow is written in free verse with very short fragments of sentences on the page. I read it cover to cover in slightly over an hour. It's not written in an overtly poetic way or anything, it's just looks like Sandell hit 'enter' while she was writing way too much. It reads normally, so if you can get passed the weird format, it's fine. The story itself was utterly fantastic, I thought. For me, Elaine has always been one of those characters whose story is just brushed aside. But as Lisa Ann Sandell wonderfully portrays, there is much more to Elaine than just a love-struck helpless maiden. In Song of the Sparrow, she's brave and protective of those she loves. Of course, if you're familiar with the original version, Song of the Sparrow still follows that basic structure of that, so there are some intense moments. 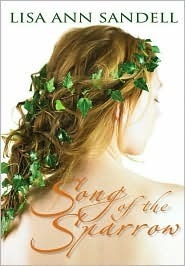 Overall, I really enjoyed Song of the Sparrow. I don't think it's for everyone though. But if you enjoy Arthurian legend, or any kind of early historical setting with a sweet romance, then this is definitely for you. 4 out of 5 stars. This one looks really good. It does sound like a good book for me. I'm not sure how I feel about the format, but I guess I'll just have to check it out and see. Thanks for the review!